As a Catholic school, St Columban’s shares in the mission of the Catholic Church. Christ’s commandment, “to love one another as I have loved you” is the basis of all faith communities. Pastoral care gathers all the qualities and practices within a community that seek to make this commandment real. Wellbeing is the concept which underpins pastoral care. St Columban’s is focused on the wellbeing of the whole school community. We are conscious of the need to promote healthy wellbeing in all areas of the human person. Mental health is of paramount importance. We recognise the flow on effects of mental wellbeing to academic achievement and whole of life satisfaction. We are a Positive Behaviours for Learning (PBL) school – using this framework as a basis for student wellbeing. Within this framework the students are explicitly taught expected behaviour and can accumulate ‘gotcha’ rewards for demonstrating these. We also incorporate the Positive Education (PosEd) framework. PosEd is an approach to education that blends academic learning with character & well-being. Preparing students with life skills such as: grit, optimism, resilience, growth mindset, engagement, and mindfulness amongst others. PosEd is based on the science of well-being and happiness. The PosEd framework is also used with great success at San Clemente high school, which our students attend after Year 6. As we share a campus, this assists with transition to high school for our Year 6 students. Where a need for specific assistance is identified, St Columban’s offers the services of a School Counsellor. The school runs a number of other programs throughout the year targeted to the needs of individual students. These include Zones of Regulation; Cool and Friendly (anger management); Skill Streaming in Early Childhood (prosocial skills), Bounceback (resilience) and Seasons for Growth (bereavement). 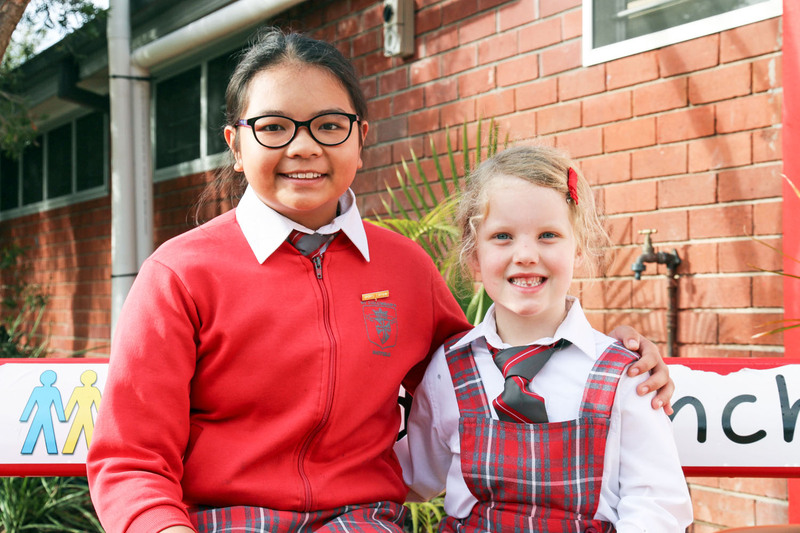 When students enrol at St Columban’s in Kindergarten, they are supported in their transition by a buddy allocated to them from the following year’s year 6 class. These buddies work throughout the Term 4 of the pre-school year to help the new Kinders learn the routines of the school and settle in the life of a “big schooler”. Restorative Practices form the basis of our discipline procedures for times when students do not behave in a way that displays respect, responsibility and concern for the safety of self and others. The focus is on personal accountability and restoring the broken relationships rather than retribution and punishment. This means that we seek to help students learn from their mistakes, reconcile and resolve problems with others. Students at St Columban’s Primary School, Mayfield are supported in their learning by a Learning Support Teacher and four Learning Support Assistants. The Learning Support team work to support both the Pastoral and Academic needs of the students. St Columban’s has the services of a Clinical Psychologist, provided through the Catholic Schools Office, working at the school. The psychologist provides support with academic and social assessments. Recommendations are made to assist parents and teachers to cater for the ongoing educational needs of the students. Our school employs an EALD teacher to assist new arrivals and those students from a Language Background Other than English. This teacher works with children individually and as part of their class to help them feel confident at school and in interactions with their peers.